A Thing of Eternity wrote: Writing style is closer to D:V than Dune. D:V? IDK, it's a bit too technical for Whipping Star. I think maybe The Godmakers(?) or The Heaven Makers are closer, as they focus more on 1 or 2 char's, instead of D:V jumping around a bit. Or even Dragon In the Sea/Under Pressure. I'd say all the ConSentiency books are a bit like Asimov's Alija Bailey(?) books, i.e the early robots series when it was more of a detective story, only FH's are packed with some philosophy. Dude, gotta read Destination Void. Yes yes you do, it is a mind bender for sure. Back on topic, I just finished reading Whipping Star and it was sweetness. Nice story plus there was decent science discussion and I love the sentients that FH includes in this story. Top notch. Read Dosadi Experiment yet? Do it. Immediatly. I didn't really get much "science" out of Whipping Star, people keep saying that, but that's not what I thought it's strength was. Maybe I'm not including some concepts under science that I should be? I wouldn't mind hearing your take on this. I have to give another "Harumph!" to D:V. I loved it. The ending really grabs ya by the booboo. Have read Dosadi, also top notch and enjoyed it thoroughly. Have to say though while recommendations are being handed out you should read D:V, some of the best fiction to be put into print. Whipping star, I agree that it discusses lots of concepts in philosophy and communication but those are not my strong points so I focused more on the bits of science that it actually has in it. Anymore most sci-fi completely ignores the science and acts like we are dumb but in this novel it did discuss some technical topics. Maybe instead of science I should have said mathematics, to me science is mathematics with appropriate labels. I can't remember off the top of my head but I know that there was some logic games that McKie plays that are quite well done. As well as other examples that I can't thing of due to lack of sleep, newborns are great for the brain! Freakzilla wrote: I have to give another "Harumph!" to D:V. I loved it. The ending really grabs ya by the booboo. I'm still tempted to type it here...Ah damn FH and his catchy phrases! I just recently finished Whipping Star and Dosadi Experiment. Great books. Whipping Star has some of the hallmarks of a typical sixties SF novel - a central mystery, a brave male protagonist, aliens, and future tech as envisioned at the time. What raises it above the typical pulp fare is its focus on ideas rather than the breathless action you would find in a sixties-era Heinlein, for example. In others' hands, the extended conversation between McKie and Fanny Mae, for example, would be a disaster, but Herbert's portrayal of the difficulties in communicating with something utterly unlike us is masterful. Summary: Herbert's sixties SF pulp is deeper and more complex than most other authors' best work. Read it. Pretty funny. Pacifist torturer Abnethe. Rug-dogs. Dragged a bit in the middle after 20+ arms had been chopped off. Got a headache trying to understand Fanny Mae. 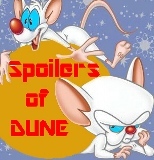 in Road to Dune, tweedledee and dum coughed up this thing called "Dune: Whipping Mek"
I have no idea what you're referring to here, Why not open a new thread on The Dosadi Experiment so we can get some details.